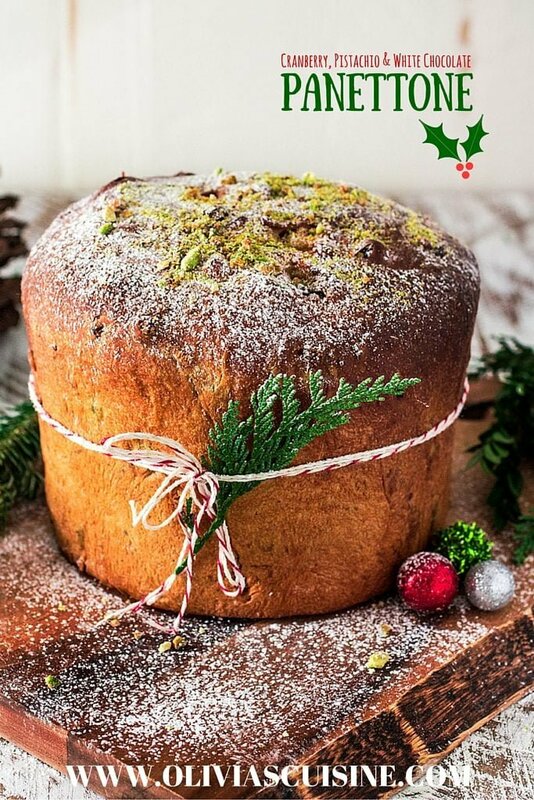 There simply cannot be Christmas without a loaf of freshly baked panettone! Christmas is almost here and I’m sure most of you are already baking lots of delicious things! Everybody has their own holiday traditions, and for me that was always eating lots of panettone during the month of December. If you’ve never heard of panettone, you are definitely missing out. It is a super delicious Italian sweet bread, originally from Milan, that is prepared and enjoyed for Christmas and New Year. Down in Brazil, a huge variety of panettones start appearing at the grocery store at this time of the year. Traditional panettone (which contains candied orange, candied citrus peels, lemon zest and raisins), chocolate panettone, with nuts, with dulce de leche, with Nutella, cheap, expensive, “gourmet”, you name it, we have it! 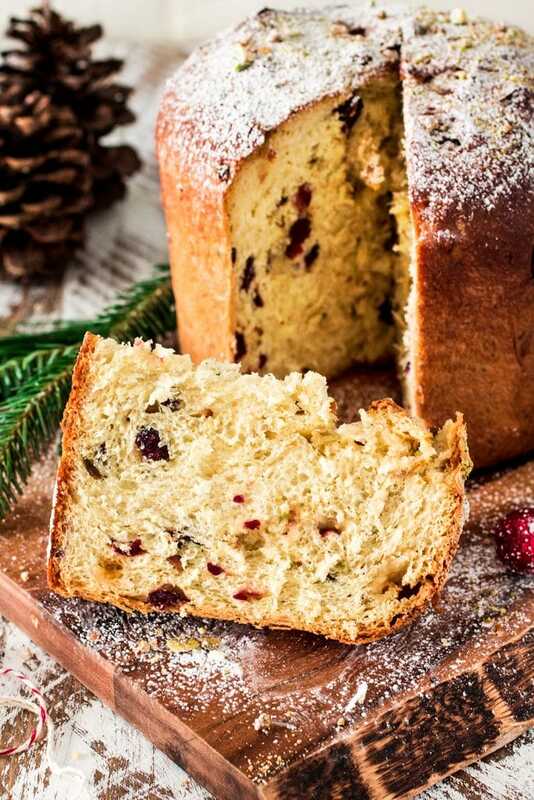 Oh yeah, we Brazilians love our panettone and they are mandatory at every Christmas table. Sometimes I think they are more popular in Brazil than in Italy! So this year I decided to bake my own panettone. I had never made it before, or seen anyone making it, since my family always buys it from the store. All I can say is that it was definitely a challenge. I spent all this last week testing recipes. It was a total of 5 panettones, lots of sweat, tears and loooots of early mornings (you should see my dark circles right now!) until I achieved the “perfect” one. Either I wasn’t satisfied with the amount of fruit/nuts/chocolate in it, or I went too heavy with the rum, or the panettone tasted great but didn’t look pretty enough for pictures. Because you gotta be fabulous looking to make it to Olivia’s Cuisine! ? And, as usual, a huge thanks to my lovely coworkers for being my guinea pigs and eating all my failed experiments. To be completely honest with you, making panettone is not easy. I mean, the recipe is not incredibly hard and most people will be able to follow it without any major problems, but it is a long process. So you definitely have to plan for it! Some recipes take up to 3 days of work, which is time that I do not have. So I settled for a recipe that is slightly adapted from Laura Vitale’s version that takes only one day, and I am pretty happy with it. This panettone is possibly one of the best panettones I have ever tasted. It is light and buttery, with just the right amount of sweetness. My main challenge with making panettone was the fact that almost all the loaves I made deflated when I took them out of the oven. You see, the panettone doesn’t like to leave the warm, cozy oven. So when you take it out, it wants to sink inwards and cry. But you gotta say “No, NO, Panettone! Get out of that funk!” and then put it to rest upside down, so it doesn’t sink in. It may seem like a crazy technique, but the solution I found (thanks to my friend Mr. Google) was to run two or three bamboo skewers through the center of the loaf and then hang it upside down by propping the ends of the skewers on the sides of a large, deep pot. Yes, your panettone will have a few small holes in its sides, but that is definitely better than the alternative, which is an ugly panettone with a sunken dome. The dried cranberries, pistachios and white chocolate morsels really take this classic up a notch. I find it even better than the traditional panettone! However, while you shouldn’t try to substitute any ingredients for the base recipe (unless you are a seasoned baker), you should be able to substitute the fruits, chocolate and nuts to whatever you’d like. Whatever you do, make sure you always use good quality ingredients. If using chocolate, I highly recommend Nestle Toll House morsels, for their good quality and convenience. And, to celebrate the holidays, Nestle Toll House is giving you guys a $0.50 coupon when you buy any one (1) Nestlé® Toll House® Morsels or Cookie Dough! YAY! ??? Before you start gathering your ingredients to make your panettone, don’t forget to order some panettone molds online. An 8 inch deep cake pan will work, but the molds not only look super cool – especially great if you’re giving the loaves as gifts – but they also make our lives much easier, as you will have one less thing to wash later. And now, all that is left to do is: make panettone! And then enjoy it with coffee or a sweet wine, such as Asti or Moscato. If by any chance you end up with some leftover panettone, you can make panettone bread pudding and/or panettone french toast. Yum! ? But if you’re anything like me, chances are you won’t have any leftovers… And that’s totally okay, since you can always make some more! ? Start by mixing the water and the milk in a small bowl. Microwave for 30 seconds and wait for the temperature to be approximately 110 degrees. Then, sprinkle the yeast and let it sit for 10 minutes or until the yeast is activated. Add 1 tablespoon of sugar and 4 tablespoons of flour to the yeast mixture, whisking to combine. Cover with plastic and let it sit in a warm place for 30 minutes to one hour, or until doubled in size. In a small bowl, mix the cranberries and the rum. Reserve. In the bowl of a stand mixer, whisk together the eggs, the sugar, the vanilla extract and the orange zest. Add the yeast starter and continue whisking to combine. Using the dough hook, turn the mixer on low and slowly add the flour and the salt. Once everything is incorporated, turn the speed up to medium high and let the mixer knead the dough for 5 minutes. Then, add the butter and knead for another 5 minutes. Add the cranberries, morsels and chopped pistachios and mix just until incorporated. Transfer to a well floured surface and knead the dough by hand until silky and not too sticky. Place it in a oiled large bowl and brush some vegetable oil over the top to prevent a crust from forming. Then, cover with plastic wrap and with a kitchen towel and let it sit in a warm place for 4 hours, or until it's tripled in size. Brush a panettone mold (or an 8 inch deep cake pan) with melted butter and reserve. When the dough has risen, transfer it to your floured counter and punch it, kneading it just till it's silky again. Form it into a ball and transfer to the buttered panettone mold. Brush the top with melted butter,, cover with plastic and a kitchen towel and bring it to a warm place again, so it can rise for another 2 to 3 hours, or until tripled in size once more. Remove mold from oven, and run a wooden skewer horizontally through the bottom of the panettone loaf. Hang the panettone upside down by propping ends of each skewer on a large, deep pot. Let cool completely. Store at room temperature, well-wrapped, for up to a week; freeze for longer storage. P.S. 2 Disclosure: This post contains affiliate links and, if you buy anything from these links, I’ll receive a small percentage of the sale. It will not cost you extra! 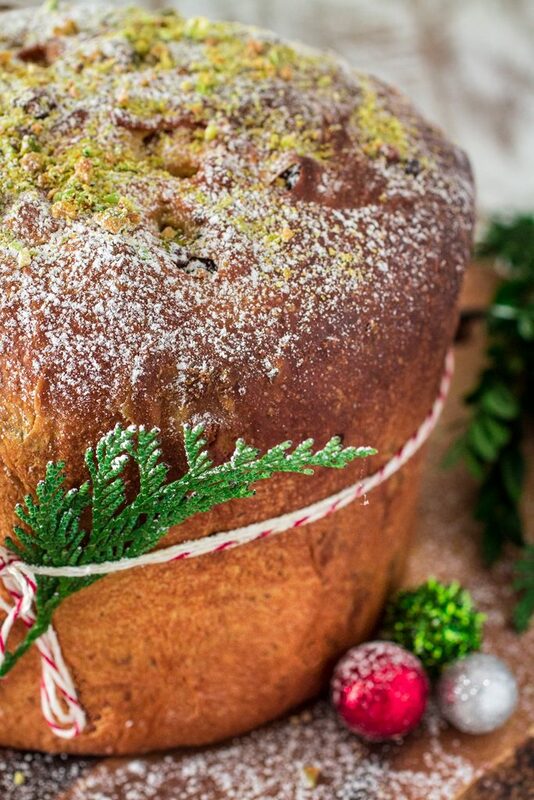 Panettone is definitely quintessential holiday season and yours looks FABULOUS, Olivia! Obviously all your trials and errors were totally worth the effort because you totally nailed it with this one! LOVE the cranberry, pistachio and white chocolate up in here! I could eat this whole loaf all by myself! Pinned! Cheers, girlie! This is the most beautiful Panettone I’ve ever seen! And surely must be a delight! You know, of all the Christmas things, the Panettone is my favorite and I can eat a whole Panettone myself! Congrats!!!! This is absolutely gorgeous! I have never had the nerve to make panettone but never wanted to buy the one in the box. I am going to give this a try this year since I am always in charge of dessert! 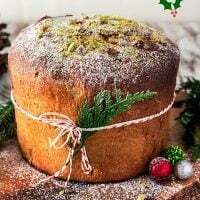 Recipe looks amazing, I have added panettone mold in my purchase list…Can u suggest any other alternative – can I use greased brown paper bag or is there any way of making one at home. 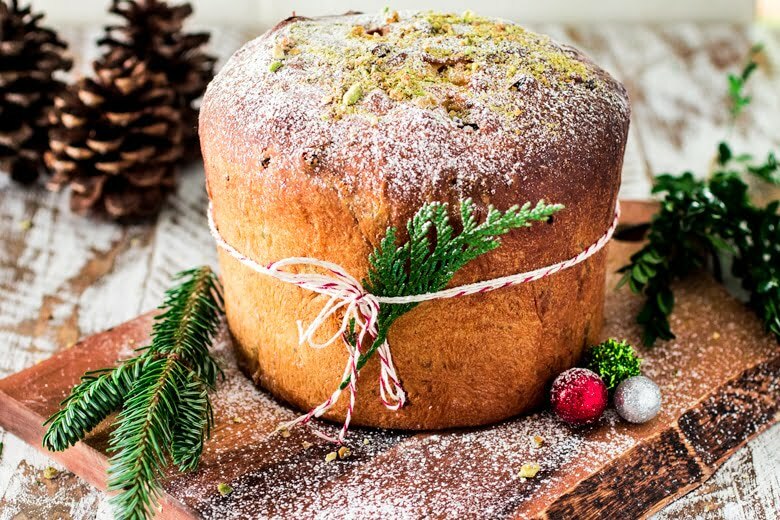 i followed this recipe but my panettone didn’t rise at all in the oven – is there anything you suggest may be the reason ? Thanks!